Embers has been a completed quilt top for a long time… Since November of 2013, in fact. I’ve got the binding fabric and batting furnished. I need to figure out a backing fabric. The batting I have is a dark batting to prevent white bearding through the top, so I need a backing that is sufficiently dark colored enough to not show the batting. Very pretty! Good luck with your February goal. Thank you! 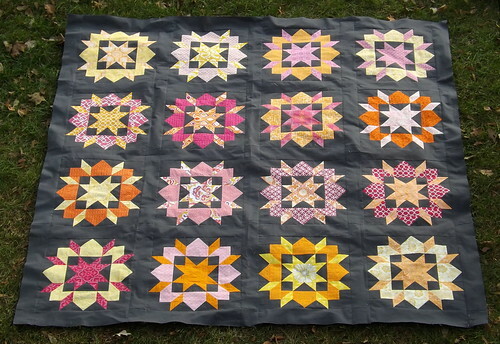 I’m really looking forward to getting this one done – mostly because I want to play with the quilting. Oh, that’s just gorgeous! I’ll look forward to seeing it complete! This is one of my favorite tops – I can’t wait to play with quilting it.